On April 4th, place your preorder for for one of 4,190 Jeep Gladiator Launch Edition models and an opportunity to win $100,000 to go anywhere, do anything, and live your passion. All other trim levels will be available shortly thereafter. Fill-out the form below for updates. Own a piece of history. The Gladiator Launch Edition is a limited production run of 4,190 vehicles, which is equipped with nearly every package and feature available. This enhanced version of the Rubicon comes complete with leading-edge technology, unstoppable off-road capability and a truly outstanding representation of the Jeep Brand’s legendary dedication to authentic adventure. When adventure calls, Gladiator is more than ready to haul your gear—and keep it secure in multiple ways—thanks to an available Best-in-Class payload of 1,600 pounds and an available Best-in-Class towing capacity of 7,650 pounds. The Gladiator Rubicon is at the forefront of legendary Jeep® Brand 4×4 capability thanks to a variety of impressive standard features, including front and rear locking differentials, the 4:1 Rock-Trac® 4×4 system, a Segment-Exclusive sway bar disconnect, rock rails, and branded FOX shocks—ready to help you conquer nearly any terrain. Gladiator allows you to fold down the windshield and remove the doors and the Freedom Top® hardtop for multiple ways to feel the wind, have fun in the sun or sleep under the stars. 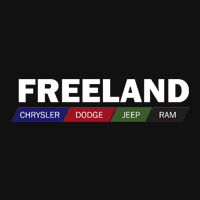 Freeland Chrysler Dodge Jeep Ram	36.0366761, -86.6431822.